DISPLAY MODEL ONLY. LISTED AT 2019 PRICE. SEE SALES ASSOCIATE TO ORDER. ~20x28 stick built garage w/ 97.5" walls 2x4 16"O.C. ~ 5/12 pitch trusses 24" O.C. w/ 5/8 advantec sheathing ~30 year LP SmartSide Siding w/ paint ~ 8" overhangs w/ 1x6 fascia ~30 year Architectural shingles. Includes optional Carriage House door, automatic door opener, and insulated windows. Price does not include foundation. 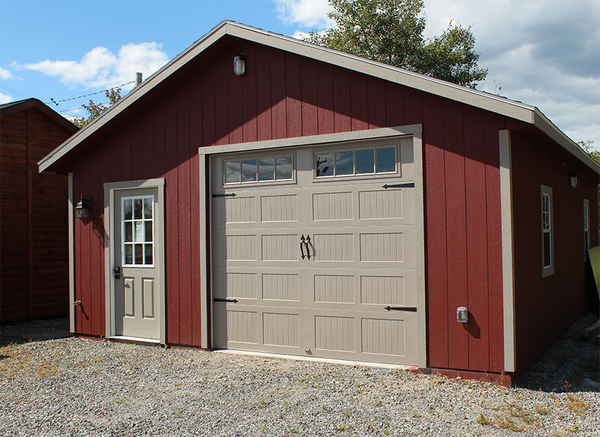 Sales tax does not apply to stick-built garages.